LAS VEGAS, Nevada (CNN) -- A Nevada Democratic presidential debate that was to have been co-hosted by Fox News Network was canceled by organizers, in part because of a joke by Fox Chairman and CEO Roger Ailes about presidential contender Sen. Barack Obama. Democrats canceled the debate Friday. They said a comment by Ailes during a Thursday night speech to a group of radio and television news directors indicated the network was biased against their party. "It's true that Barack Obama is on the move," Ailes said, deliberately confusing the Illinois senator's name with that of terrorist leader Osama bin Laden. "I don't know if it's true President Bush called [Pakistan President Pervez] Musharraf and said, 'Why can't we catch this guy?' "
Even before Ailes' remarks, there was intense pressure from the liberal group MoveOn.org to cancel the August event as part of its boycott of Fox. 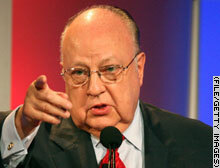 Ailes has served as a campaign adviser to Republican candidates, including former Presidents Reagan and Bush. Democratic presidential candidate John Edwards dropped out of the debate Thursday, citing, in part, Fox's participation. Fox News Vice President David Rhodes responded to the debate cancellation with a written statement saying MoveOn.org owns the Democratic Party. A joke about a presidential candidate by Fox News Chairman and CEO Roger Ailes sparked outrage in Democrats.